This question comes up every now and again, so I thought that I would write a little about this style of kayak paddle and why we like to use it for paddle-sailing. My intent here is not to persuade you to change the paddle you are currently using, as most paddle-sailors have their own likes and dislikes. I simply wish to introduce you to this unique paddle and do my best to review it’s qualities. 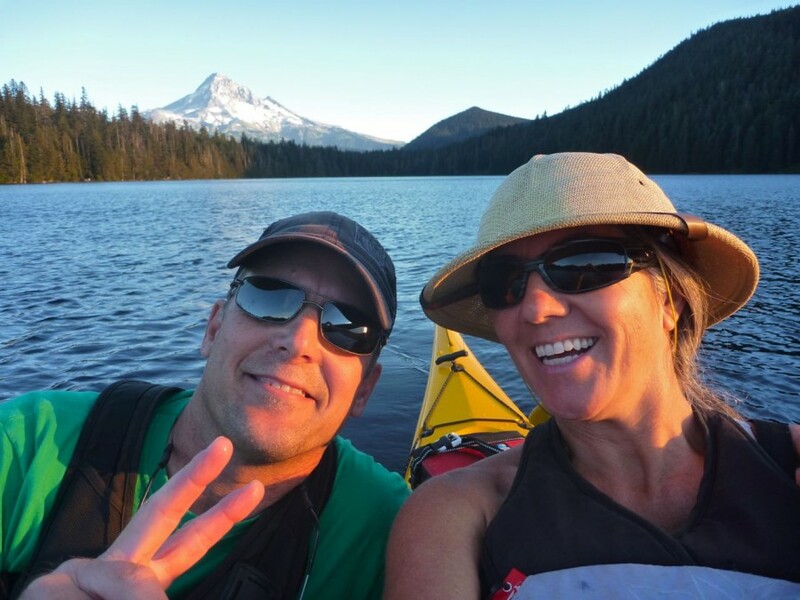 Over the years Patti and I have used a variety of paddles with the Kayaksailor, each having their own advantages and disadvantages, and the one that seems to stand out in terms of performance and “feel” is the traditional, Aleutian Island double blade. You’ve probably noticed these long wooden paddles in our photos and videos. It’s an old school design, developed by the Aleut, who are the indigenous people of the Aleutian Islands of the North Pacific. The Aleuts are masterful watermen, who with limited resources, created astonishingly sophisticated skin-on-frame sea kayaks called Baidarkas, and paddled them with refined paddles. How old is “old school” you ask? Well… no one knows for sure. Evidence suggests that long before the human migration across North America to Greenland, people paddled the waters of eastern Siberia and the northern Pacific island chain in kayaks. 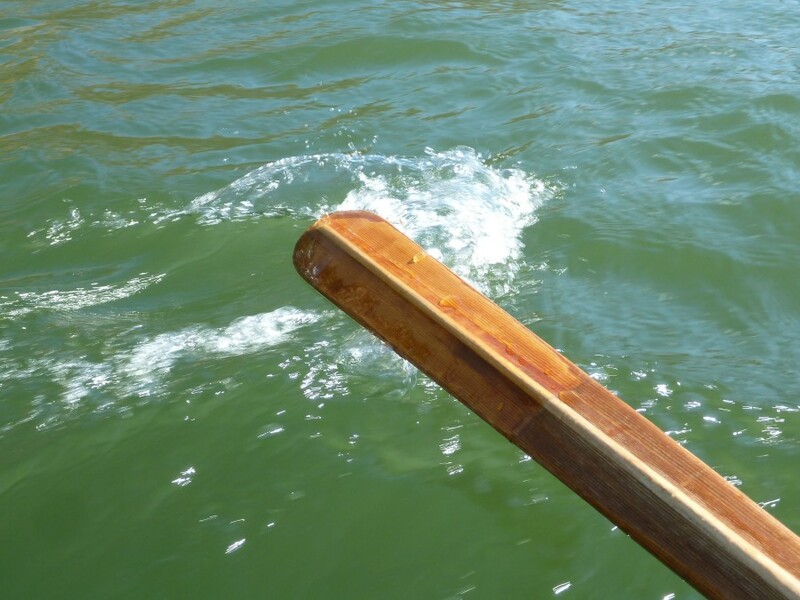 While some of the earliest archaeological evidence of skin-on-frame boats dates back at least 2000 years, some have found artifacts related to kayaking, such as paddles and deck rigging components, dating back as far as 5000 years. 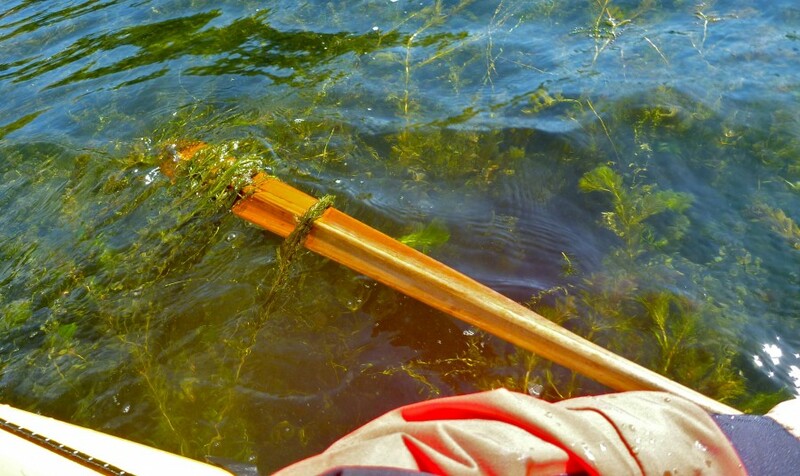 In short, Pacific kayakers have had plenty of time to refine their gear. Even with today’s advanced computers, in my mind the traditional designs of the Aleuts reached an apex in skin-on-frame kayak sophistication and craftsmanship. These remarkable people routinely paddled very long distances, often in extreme weather conditions, hunting sea mammals, fish, fowl, and whatever else they could find. Life must have been tough there, as these islands are some of the most desolate, windswept rocks on the planet. Not only did they manage to survive, but they were able to craft cool gear that was efficient and stylish as well. Back to the paddles. 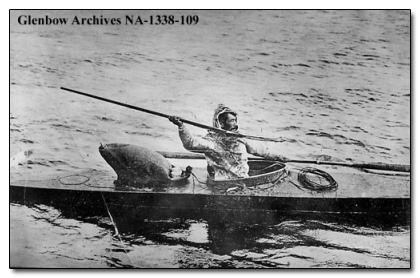 While it has been well documented by early Russian explorers that a shorter, canoe-like, single blade paddle was frequently utilized and was often seen kept on deck as a spare, Aleuts also developed a fine, long, flexible, double blade for long distance, high speed, cruising. This is the style of paddle we use. They work very well. Since we often find ourselves in strong breezes and choppy seas, covering long distances at relatively high speeds, we too are able reap the benefits of the design. Aside from the natural beauty of oiled wood, one of the first things most people notice about the Aleut paddles are their relatively long length and the narrow blades. Our own paddles are (244cm) long and (8.3cm) wide at the widest point and are quite a bit longe r than most Greenland style paddles. The length and the narrow blade shape is designed for prolonged, shallow (less vertical) strokes. And this, combined with ample flexibility in the shaft, is gentle on our aging shoulder joints. These attributes also allow for effective paddling in very shallow water, a real plus for inshore cruising. 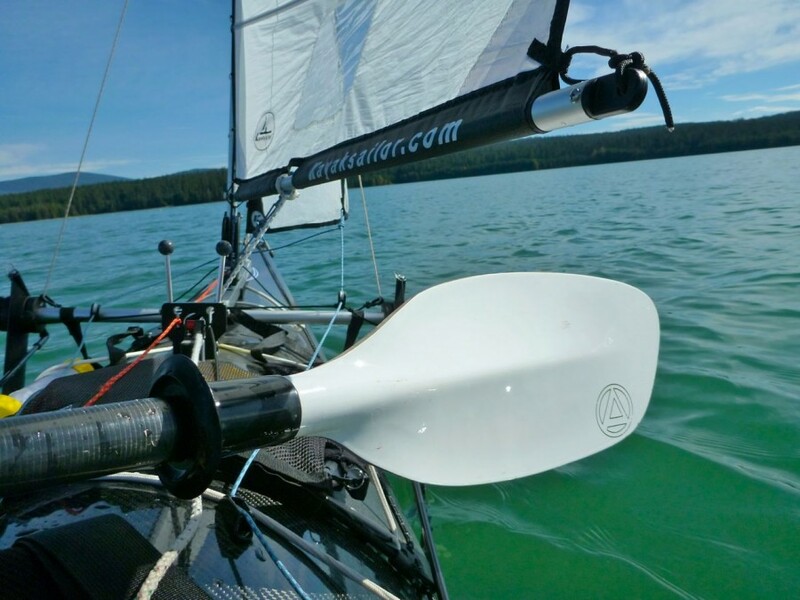 Additionally, the low angle arc of the blade in the air is less prone to come in contact with the sail, also a plus for paddle-sailing. reaches where the boom is set half way out and the gap between the boom and deck is less than on, say a broad reach or a run. The image on the left shows a more common mid-sized touring blade, and while there is still distance under the boom, narrow blades definitely have an advantage here. In general, narrow blade faces are easier to control in strong winds. They are far less likely to get ripped out of our hands in the intense 30-40 knot wind gusts, which are all too common here in the Gorge during the summer months. Wide style blades, with the majority of their surface area concentrated near the ends of the shaft, can suddenly catch a wind gust and become difficult to control. 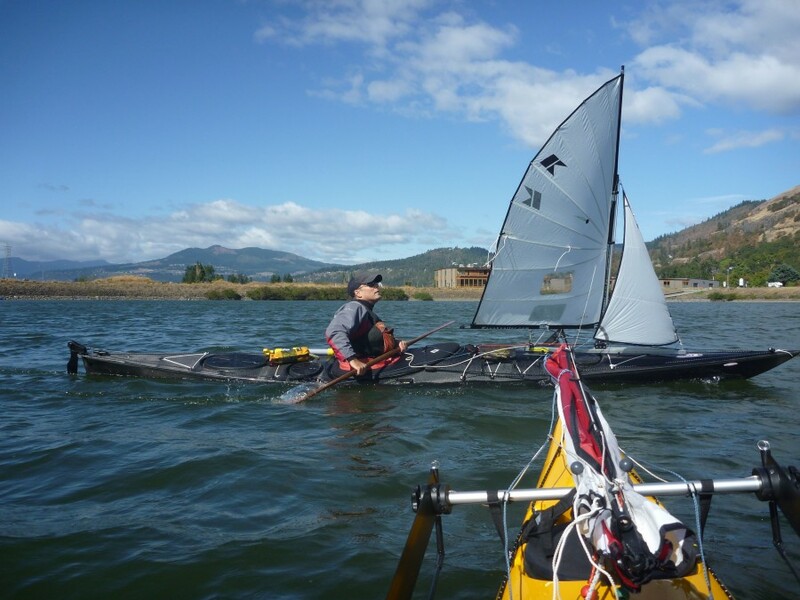 Many paddlers using wide blades simply feather the blade angles in an effort to reduce this windage, but we’ve found that at least for kayak-sailing when it’s really windy, the narrower non-feathered blade is just easier to use. The paddle shafts have a comfortable, ergonomic oval shape to them, which lets us know the blade orientation, making them easier to brace with in an emergency, since there’s never a question of whether the blade is flat against the water or not. Additionally, the small unfeathered blades can be conveniently slid under the cross tube, making them easy to stow. 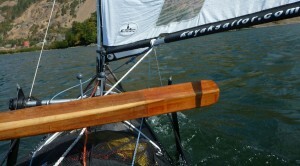 The long paddle length is good for steering and can be especially useful while sailing. When doing a stern rudder stroke, the blade can be positioned closer to the stern where it can better act as a rudder, and the forward sweeping stroke is able to start closer to the bow, allowing the bow to be pushed sideways more effectively. 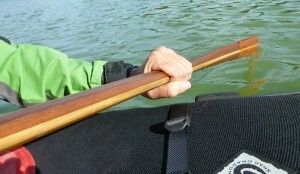 A long paddle increases bracing leverage, and offers increased stability during paddle-float, and float-less re-entries. That said, longer paddles can be a disadvantage in certain situations. Paddling in close quarters, one is more likely to hit rocks or other kayaks with the blades. They also require slightly more attention when in areas of dense sea plants. 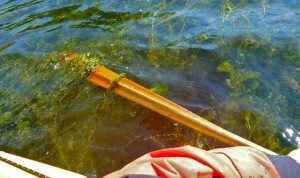 In this case, a delayed or exaggerated stroke finish is needed to let the plants clear from the blade face before lifting it from the water. Fortunately, the proximal blade transitions from the shaft smoothly and plants slide off relatively easily. Also, since the paddles don’t have ferrules in the shaft, storage and transportation can sometimes be an issue. I’ve seen some cool wood Aleut paddles with ferrules, but I can’t help wondering if the shaft strength would be somewhat compromised. 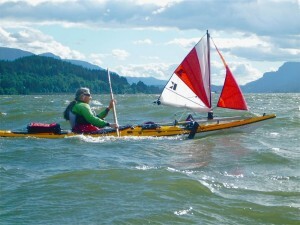 Paddle-float reentries in rough water can be stressful on a paddle. Unlike the much more popular wooden Greenland paddles, most examples of Aleutian double blades have asymmetrical faces, meaning, one side of the blade is shaped differently than the other. The power face of the blade (normally facing the back of the boat), has a raised longitudinal ridge running down center line, and the backside has a slightly convex, or somewhat domed shape to it. The ridged power face helps prevent the blade from chattering (moving erratically up and down) during the power phase of the stroke, as well as helps direct the water down the face of the blade. The domed back allows the water to move around it with little, if any, cavitation (the formation of air bubbles from the low pressure). The result is a blade that is both quiet and powerful, and allows for a smooth comfortable stroke. For bracing under sail, the ridge-less, domed back slides over the water’s surface nicely. For this reason, we’ll often subconsciously flip the blade over while sailing. Lastly, the satiny texture of the oiled cedar just feels really good in our hands. It’s a natural feeling. Plus, since wood is a better insulator than carbon, our hands stay warmer on those cold days out on the water. 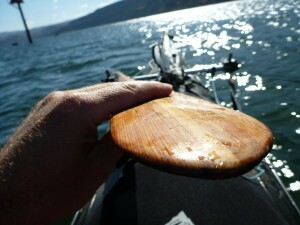 Our paddles came to us already pre-shaped by Corey at the Skin Boat School in Anacortes, Washington (Washington State). The paddles are not made in the traditional way, by carving a single piece of wood, but created by laminating several cut pieces together. In this case, red cedar and a spruce core, for a good combination of light weight and strength. If you are interested in making your own paddle, or learning more about Aleutian island designs, a web search should yield enough information to get you started. 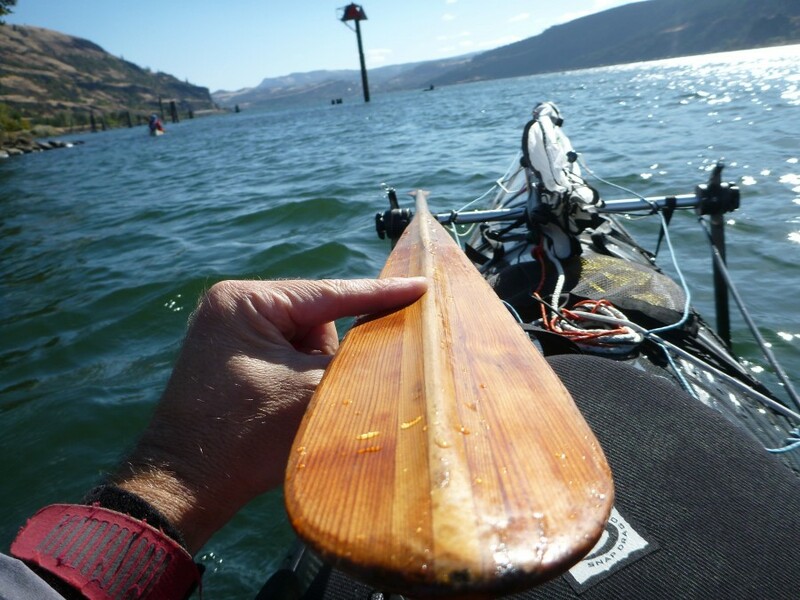 We definitely recommend giving this style of paddle a try. And, please let us know what you think! I build aleut paddles and kayaks myself. I have studied the original aleut designs for many years, and am wondering if you know of David Zimmerly’s work? He was the kayak ethnographer for the Canadian national museum. The thing that I’ve noticed recently is that a lot of people are paddling aleut knockoffs that are more like a greenland paddle in dimension. Zimmerly spent his lifetime going around to museums and measuring all known remaining specimens. The thing that seems odd to me is that most of the paddles he measured had blade widths in the 120mm to 160mm widths, but most of these modern “white boy” interpretations are blades that are under 100mm. I took a lap around Tahoe this winter with a guy who had a paddle made by a well known PNW boat school owner, who will remain nameless, but whose initials are Cory Freeman. It was only 75mm wide, and the poor guy couldn’t keep up with us, as we were paddling more historically “correct” aleut blade widths of 125 to 130mm. I would recommend to anyone who is paddling these ultra skinny blades, that building a slightly wider blade to see what the Aleuts actually were paddling is probably worth your while. I think you’ll be pleasantly surprised at how much these folks knew after 3000 years of paddle evolution. cheers, Chris. 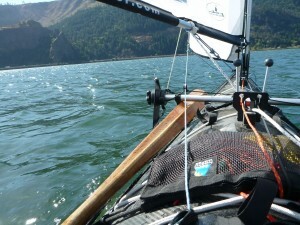 sliding between brace and power or rudder strokes – I was sold on that design as the most versatile tool. My whitewater paddles were zero and 15 degree feather so the angle transition was seamless. This past winter I mounted a thru-deck receiver to accommodate the top half of an old windsurf mast and learned enough about broad seaming to build a full batten .75 m sail, which I’ve used about a dozen times this summer in my Impex Force Cat 3HV. 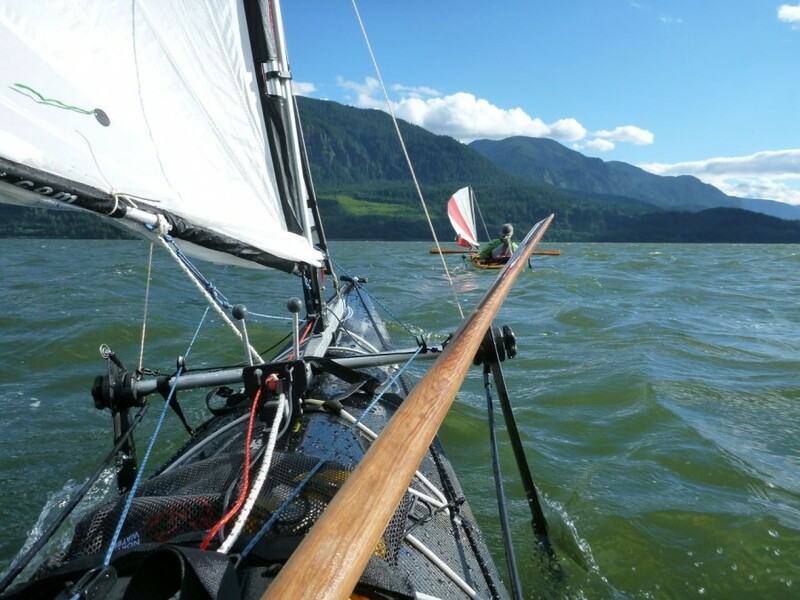 The 20.5″ beam is very ‘tender’ for sailing close hauled but I enjoy ‘motor’ (paddle) sailing in the 5-15 mph wind range and downwinding in stronger wind conditions. 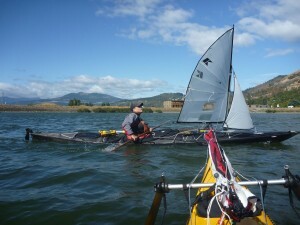 My experience thus far is that kayaks are not sailboats (unless off the wind) but the combination of paddle/sailing is interactive and interesting. I’ve been thinking about making or buying a longer paddle to add more bracing area. I’m curious about the advantage of the ridged side of the Aleut paddle as well as the weight of the Aleut paddles you use. I’ve never noticed issues with fluttering using the traditional curved power face Greenland paddles. A friend builds greenland paddles and flattens one side and I have encountered flutter trying to get the hang of using the flat-sided face of his paddles but not otherwise. The ridge on the Aleut paddle seems like added material and therefore added weight unless it offers some clear advantage?